Field Supervisor of Trench PC 23, Robert Vander Poppen. Week 4 has been an exciting one atop Poggio Colla, and especially in Trench PC 23. The numerous finds along with the rapidly revealed stratigraphy within the trench have begun to help piece together a narrative for the activities which took place there. At the beginning of the week, we were still wondering about the nature of the mudbrick spill that lay across the two western-most loci of the trench. Now, at week's end, I can clearly say that the mudbrick is indeed a fallen wall rather than a floor packing. Definitive evidence came midweek in the form of a number of finds. Josh, Sarah and Tamee excavated a scatter of sherds belonging to a pair of vessels that were smashed when the mudbrick wall fell onto the floor. 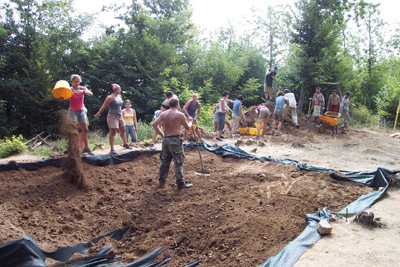 Occasionally, when digging, a rock or a piece of dirt is removed that allows an excavator to clearly picture the events which occurred in the formation of an archaeological deposit. The discovery of these vessels was one such moment. As they lay in the earth it was possible to imagine them sitting on the floor level when the wall collapsed and broke them into pieces, trapped underneath the mud brick until we uncovered them. Liz and Lyn, a volunteer from the University of Pennsylvania Museum, uncovered a further piece of evidence both for a floor level and for the vessels having stood upright at the time of their destruction in the form of hundreds of seeds scattered in the soil near the smashed vessels. These finds are incredibly important, as we have been looking for evidence of the floor level of the building for numerous seasons, and now we have definitive proof. Sarah Titus, Liz Wallace, and Tamee Bollinger in PC 23. In the other end of the trench we have learned a great deal as well. Nat and Mike have now expertly removed the deposit surrounding our large blocks in the eastern portion of the trench. The deposit was comprised of dark, greasy black soil, indicating that some kind of burning of organic material had been a part of the creation of the layer. This layer surrounds the blocks and penetrates all the way down to the depth of the bedrock in this area of the trench. In addition, the bedrock immediately surrounding the blocks is a bright red color instead of the typical golden-green. This too is indicative of a heat related formation process. All of these signs point to the interpretation of the blocks as an altar or central fire pit within the monumental building atop Poggio Colla. If we had only discovered this much about the blocks it would have been a great discovery. However, in addition, Nat and Mike discovered that Stratum 3 does indeed cover the dark soil surrounding the blocks, a fact not yet clearly ascertained. This means that the event which formed the burned deposit was occurring before the deposition of the third stratum. What exactly that tells us will have to be sorted out in the coming weeks. 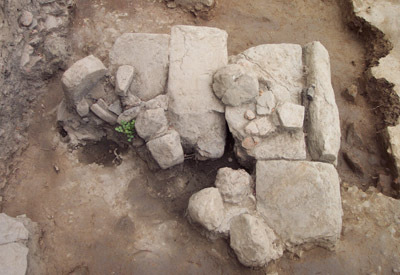 Further definition of the large blocks in Trench PC 23. Mike Glover (back) and Nat Kerr excavating in Trench PC 23. Overall, the last week in PC 23 has made for very exciting excavation. We are now beginning to answer some of the questions which were not answered at the end of excavation last season. Hopefully, the weeks to come will tell us more about the nature of the deposit around the clandestino pit, and further refine our understanding of the chronology of the strata within the trench. 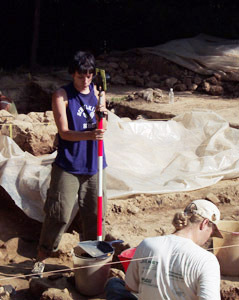 Left: Liza Wallace excavating in PC 23. 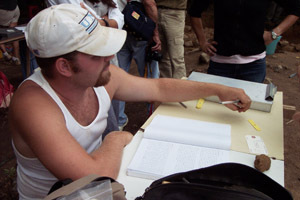 Right: Nat Kerr places small finds in a bag to send to the lab. Tamee Bollinger and Sarah Titus digging in PC 23. Left to right: Nat Kerr, Josh Moran, and Tamee Bollinger sifting. and Josh Moran. In the foreground: Nat Kerr and Mike Glover. discuss strategy for Trench PC 23, while Mike Glover digs behind them. The beginning of week 5 in PC 23 was a roller-coaster ride. Late last week we received another crewmember, Lynn Makowsky (a keeper of the collections from the University of Pennsylvania Museum). 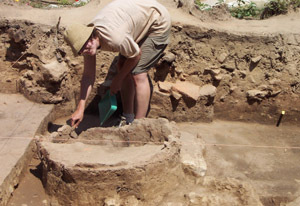 Lynn brings an excellent knowledge of Etruscan pottery and culture to the trench. On a less enjoyable note, the week has been one of the rainiest and coldest in the history of the excavation. Monday's weather was a torrential downpour, but due to the dwindling number of excavation days, the directors decided to excavate anyway. Monday's deluge directly on to the exposed soil of PC 23 has created approximately 4 inches of sludge in the southern three loci of the trench. I expect that they should finally dry to the point of allowing excavation by early next week. 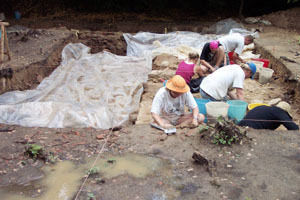 On Tuesday rain was less certain, and we excavated throughout the day in intermittent showers. Luckily, again on Tuesday it was the southern loci that flooded due to their lower elevation. This left the northern loci sufficiently dry to continue excavation. Lynn Makowsky, Josh Moran, Sarah Titus, Liz Wallace, and Mike Glover. For the remainder of the week we concentrated in this area of the trench, taking passes in two of the three northern loci. This week's excavation has served to confirm the identification of our floor level. Underneath what appeared to be the floor level, we began to excavate a packing of earlier fill used to provide a stable base for the beaten earth floor of the building. This floor packing has yielded as much information about the earlier phases of the building as it has for the phase to which the floor belongs. Inside the packing we have discovered a number of diagnostic finds which have helped to define the material culture of the earlier phases of the site. Josh, Lynn, and Justin (a volunteer from Franklin and Marshall University) all uncovered loom weights. Tamee has been unearthing a number of bone and metal fragments from the soil, and Mike, Sarah, and Liz have excavated out the densest area of the packing in the north end of the trench. Here they have been uncovering a number of black glaze vessel sherds and carbonized seeds. Mike Glover, with Josh Moran behind Sarah. The next week of excavation in PC 23 will be our last, and I am hopeful that we will be able to take the trench down to the level of sterile soil across its entirety. Our focus in the coming week will turn to the excavation of the clandestino pit in the center of the trench, and the ancient pit associated with it. Hopefully our final week of excavation will yield as much information as the five previous weeks. Sarah Titus and Liz Wallace in Trench PC 23. Sarah Titus, Joshua Moran, Robert Vander Poppen, and Liz Wallace. This week has been exciting and dry in PC 23. The rain has finally departed and work returned to its normal schedule. We have continued to concentrate on the area to the north of our large blocks as well as the central area of the trench. Near the area of the blocks Sarah, Tamee and Lyn all removed pieces of a large terracotta object which may be an architectural element. In addition, the stratigraphy now seems to favor the association of the blocks with the second phase of use of the building. In addition to this feature, we have also discovered a large circular patch of soil to the north of the blocks. This feature appears to be a footprint related to an object once heated to a great degree. 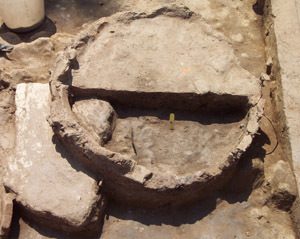 Possibilities for the function of this feature include a burned out post or a ritual basin. The idea that the feature represents a post base is supported by the discovery of one block that extends below the feature. However, the circular, bowl shaped depression seems to fit the profile of a ritual basin far closer. One final pass in the locus should reveal whether the remainder of the feature indeed sits on top of a stone base. View of Trench PC 23 from the east during Week 6. The other area of the trench which has received work is the central portion. Here we have also had a productive week. Tamee, Sarah, and Liz uncovered what seems to be another layer of decomposed mud brick at the bottom of Stratum 3. This line of decomposed mud brick may represent the floor level of the second phase of the building. If so, the correlation between the floor level and the blocks would be very attractive in that the blocks would then have been exposed to a depth of about 5 to 10 centimeters above the floor. To the north we have now exposed the extent of the ancient pit. Mike and Josh have defined its limit and begun to peel back the soil around the feature. We have also begun to discover badly corroded bits of metal from the ancient pit, suggesting that this is similar to the material removed from the trench by the clandestini. Hopefully, one final pass in this area will reveal more about our robbery two seasons ago. Circular feature in Trench PC 23. Lynn Makowsky, Mike Glover, and Susan McIntyre taking a pass during Week 6. Robert Vander Poppen dressing for success. overall site plans. Josh Moran digs in the foreground. Tamee Bollinger, Sarah Titus, Josh Moran, Liz Wallace, Susan McIntyre, and Lynn Makowsky. 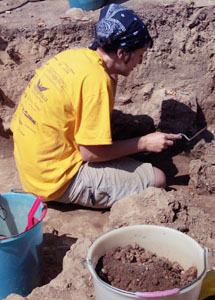 Tamee Bollinger excavating around the large blocks in Trench PC 23. Sarah Titus taking a pass in Trench PC 23. 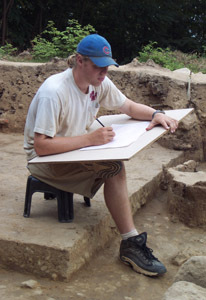 Robert Vander Poppen drawing profiles for his field notebook. Trench PC 23 exists no more. The final shovel fulls of backfill were reinserted into the ground yesterday afternoon, and now we must spend the next ten months making sense of what was accomplished this season. This year's excavations in PC 23 have helped to begin to move us in a more concrete way toward defining the nature of the building, and the pattern of activity that took place on top of Poggio Colla almost 2500 years ago. 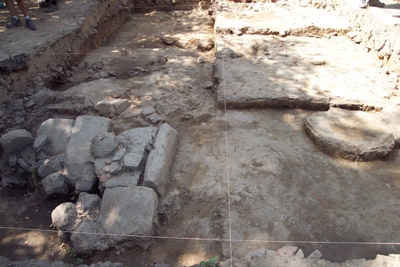 At the present moment the trench stands as the largest section of excavated terrain within the inside of the 2nd and 3rd phase foundations, and as such is in a unique position for providing information on the use of the building. PC 23 has been successful in revealing some of the facts associated with this activity. This season we uncovered our first definitive evidence of the Phase 3 floor level beneath our mud brick collapse in Locus 4. This discovery has answered one of the primary questions we had upon entering the season: whether the mud brick feature represented the collapse of a wall, or packing for a floor. The severely burnt patches of dirt in conjunction with the vessels smashed by the mud brick confirm that the spill is indeed wall fall. In addition, we have also uncovered possible evidence of an earlier Phase 2 floor level in the form of a red stain from decomposing mud brick that occurs between Strata 3 and 4. Now with evidence of these two levels of occupation, it is finally possible to begin to associate the other features within the building to specific phases of use. View of Trench PC 23 from the east at the end of the 2002 field season. Locus 4 is in the upper left corner. One of the other questions of the season concerned the function and date of the large blocks in the southeast corner of the trench. It is now clear that the blocks are a Phase 2 feature, which was reused in Phase 3 as part of the floor. However, it is also clear that the activity taking place near the blocks, and forming the deposit of dark soil around them had ceased by the time of the installation of the Phase 3 floor. The function of the blocks is much harder to ascertain than their chronology. Several possibilities for their purpose still exist. 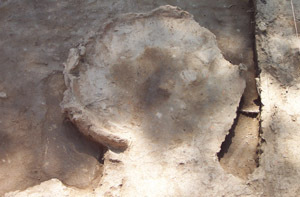 A number of large terracotta pieces decorated with plaster were discovered nearby, indicating that the blocks may have been used as a decorated statue base or altar. Another possibility has also been suggested by Patricia Lulof of the University of Amsterdam. She believes that the blocks represent a support for a post that would have aided in bearing the weight of the central ridge beam of the roof. Michael Thomas has also suggested that the blocks may represent the foundations for the corner of a smaller building which would have faced north. Both of these suggestions will only be confirmed or refuted by the further excavation of the remainder of the interior of the building on the hill of Poggio Colla. Large blocks resting on bedrock in Trench PC 23. We also discovered and excavated yet another unexpected feature within Trench PC 23 in the past week. To the north of the large blocks, we discovered a large circular patch of red stained earth. 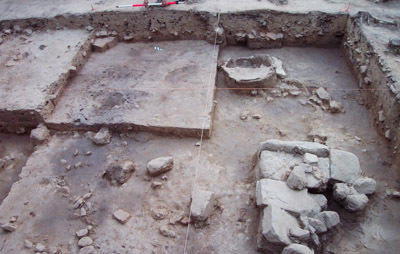 After excavating the north half of the feature in order to examine its internal stratigraphy, it is clear that the feature is an ancient fire pit. I believe it to fit into a period of chronological disuse of the site in the gap between the destruction of Phase 2 and the construction of Phase 3. The pit was incorporated into the packing for the Phase 3 floor and was covered by the Phase 3 floor level. Thus the feature was created during the period contemporary to, or possibly after the use of the Phase 2 building. The one find from within the pit, a broken bucchero rocchetto would seem to argue for an early date for the pit. Luckily the pit contained a number of large pieces of carbon that can be analyzed in order to work out a range of dates for the feature. A well-camouflaged Lynn Makowsky sweeping near the fire pit in PC 23. Feature 6, the fire pit, in the east end of Trench PC 23. 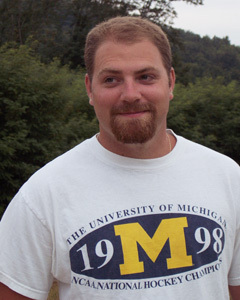 The final mystery we hoped to solve this season concerned the episode of robbery of the site by clandestini in the spring of 2001. Last year Gretchen Meyers, then excavator of PC 23, suggested that the clandestini had disturbed an ancient pit with their own modern one. After another season of exploration it is certain that her conclusion was correct. 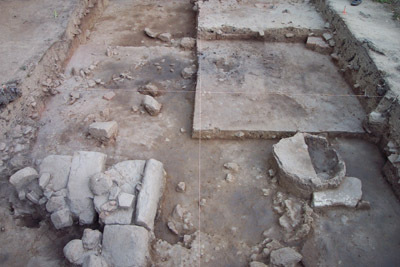 A pit was installed in the ancient period, most likely before the insertion of the Phase 3 floor, containing a densely included soil. The pit contained fragments of metalworking byproduct such as casting runners, lumps, and partial sheets. Now, having excavated the majority of the ancient pit, it is possible to make some educated guesses about what the clandestini removed from Poggio Colla. It is most likely that they removed a number of the typical finds from the area: lumps, sheets, and runners, possibly in order to use the ancient metal for recasting into counterfeit ancient art objects. Having gained all of the information about the ancient pit disturbed by the looters, we can finally take a sigh of relief due to the fact that we were able to recover at least a majority of the information destroyed by the looter's pit. View of Trench PC 23 from the south at the end of the 2002 field season. The clandestini pit was in the lower left locus in this photograph. PC 23 has been a highly successful trench due to the fact that for the first time we are able to piece together the more extensively excavated exterior portion of the building with the stratigraphy of the interior. Unfortunately, weather and time did not allow for the completion of the trench and it will be opened again next year for further exploration and to again reevaluate the conclusions reached by this year's excavation. Susan McIntyre, Mike Glover, Lynn Makowsky, Josh Moran, Sarah Titus, and Tamee Bollinger. Lynn Makowsky measures strata in scarp for Joshua Moran's final drawings. 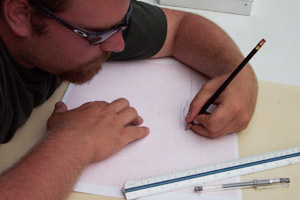 drawing profiles for the field notebook. staff shovel dirt into buckets and wheelbarrows for the trip from sifter pile to trench.